Pusarla Venkata Sindhu, known as PV Sindhu, is an Indian professional badminton player. She was born on July 5 1995 in Hyderabad. One of the youngest and most talented players of contemporary times, Sindhu has featured in the top 10 of the world rankings, for most parts of her career. P V Sindhu got her first taste of badminton from Pullela Gopichand, and drew inspiration from him. She started playing badminton when she was eight years old and later joined Gopichand’s Badminton Academy. Sindhu’s first major recognition came in the form of the 5th Servo All India ranking championship in the under-10 category. In the under-13 category, she won the doubles titles at the Sub-Junior Nationals and the All India Ranking in Pune. At the 51st National School Games in India, she won the gold medal in under-14 category. P. V. Sindhu didn’t need much time to establish herself as a promising player in the global arena. She made her international debut in 2009 at The Sub-Junior Asian Badminton Championships. She introduced herself to the world by winning a bronze medal in her first international competition. She later finished as runner-up in the 2010 Iran Fajr International Badminton Challenge, and reached the quarterfinals of the 2010 Junior World Badminton Championships in Mexico. At the age of 17, she won the Asian Junior Championships. Sindhu’s first Grand Prix win came in 2013, when she defeated Singapore’s Gu Juan to clinch the Malaysian Open title. Her form continued at The World Championships in 2013, where she went on to win the bronze medal. She repeated the same feat next year, becoming the first player from India to win a medal at The World Championships for two consecutive years. She also competed in her first Commonwealth Games later that year, where she reached the semifinals. 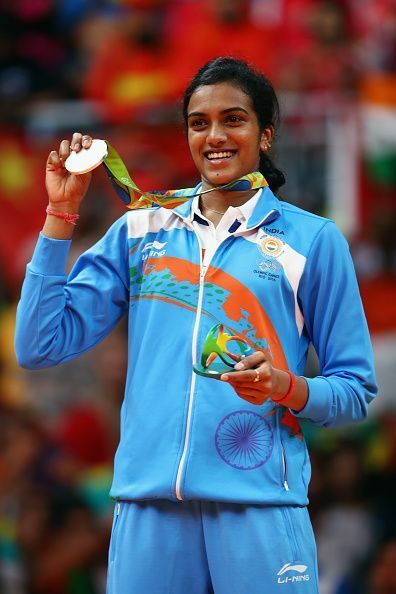 P. V. Sindhu ended 2013 on a happy note by winning Macau Open Grand Prix and the Arjuna Award, one of the highest honours for any sportsperson in India. In 2015, she played at the Denmark Open and reached the final by defeating three seeded players, Tai Tzu-ying, Wang Yihan and Carolina Marin. In November 2015, she bagged successive women’s singles title at the Macau Open Grand Prix. The biggest moment of Sindhu’s career came in the year 2016 when she went on to become the first female athlete from India to win a silver medal at Rio Olympics. She was graced with India's 4th highest civilian honour, The Padma Shri Award, later that year. In 2017, Sindhu carried on her form and went on to win The Indian Open Super Series. She further went on to win a silver medal at The BWF World Championships in the same year. After reaching the final of the 2018 World Championships , she became the first shuttler in the world to reach the finals of three successive major events. However, she couldn't bag the gold medal and had to settle for silver each time. Sindhu has continuously proven her mettle as a world-class badminton player at every stage. Under the guidance of coach Pullela Gopichand, the 23-year-old has scaled new heights in badminton and will look to add more medals to her illustrious career. Currently, she is ranked at number 6 by the Badminton World Federation.